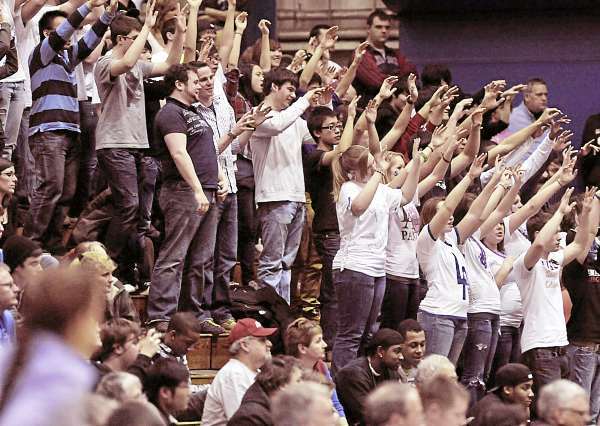 Lee Academy students collectively urge the ball through the hoop during a foul shot in the second half of their game against Dirigo Saturday March 5, 2011, at the Bangor Auditorium. 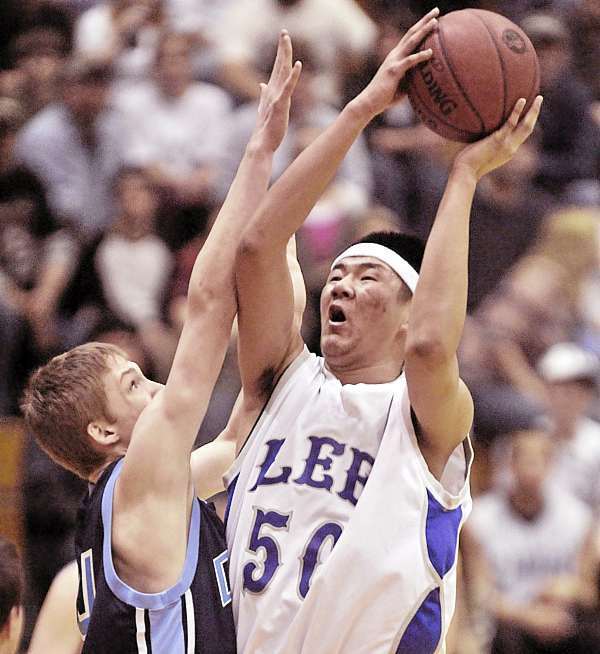 Lee Academy's Daniel He (10) puts up a shot over Dirigo's Cody St Germain ,left, in the first half of their Class C Championship game at the Bangor Auditorium Saturday March 6, 2011. Lee Academy's Bryan James (24) goes to the hoop past Dirigo's Josh Turbide , left, in the first half of their State Class C Championship game at th Bangor Auditorium Saturday March 5, 2011. The Lee Academy boys basketball team displays the program's first gold ball after defeating Dirigo of Dixfield 65-55 Saturday to win the state Class C championship at the Bangor Auditorium. Billy Nicholas (center) of Lee Academy drives to the hoop between Ben Holmes (22) and Arik Fenstermacher (23) of Dirigo of Dixfield in the first half of their Class C state championship boys basketball game at the Bangor Auditorium Saturday. 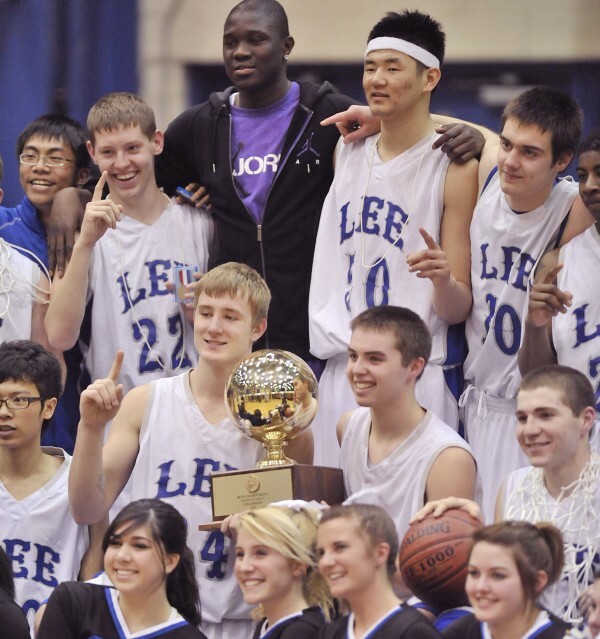 Lee won 65-55 for its first boys basketball state title. 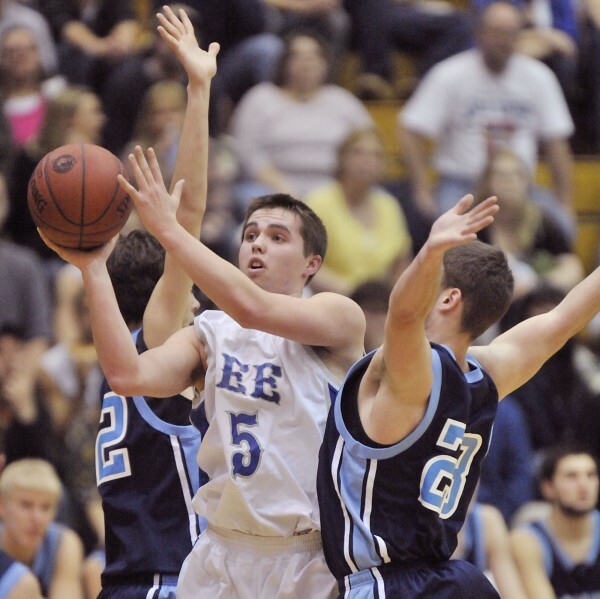 BANGOR — Even though the score may suggest a comfortable win, nothing came easy for the Lee Academy boys basketball team Saturday night. Coach Randy Harris’ club turned back multiple runs by Dirigo in the second half while getting a dynamite offensive performance by A.J. Harris to claim its first Class C state title with a 65-55 victory over the Cougars from Dixfield at the Bangor Auditorium. The Pandas led by as many as 18 in the second half, but the determined Cougars clawed back thanks to nine Lee turnovers. “We didn’t do a good job in time and score situations late in the game,” said coach Harris. Nevertheless, the Pandas persevered and wrapped up their championship run with a 21-1 record while Dirigo finished 19-3. The Pandas led by 13 heading into the fourth, but the Cougars responded, getting as close as seven on a 3-pointer by Spencer Ross and one-handed floater in the lane by Cody St. Germain. But as they did throughout the game, the Pandas answered, holding the Cougars to one field goal over the game’s final 1 minute, 50 seconds while hitting their free throws down the stretch. A.J. Harris, the coach’s son, led all scorers with 27 points, Bryan James had 18 and Daniel He 13. Harris was especially money at the foul line, going 10-for-11 on the night which was one of his rewards for his aggressiveness on the offensive end. Leading the way for the Cougars was Ross with 15 points while Josh Turbide had 13. Coach Rebecca Fletcher’s club managed to keep things relatively tight early in the second half despite foul trouble, but Dirigo settled for outside shots against the bigger Pandas. Dirigo did shoot well from the outside, with Turbide hitting 4 out of 11 perimeter shots, which helped the Cougars chip away. But the Pandas would never break stride, keeping their composure down the stretch and closing out more on Dirigo’s shooters. “They have really good shooters, that was something we were really worried about,” said A.J. Harris. The defense of the 6-foot-7 He and 6-4 guard Arturas Makovskis had a lot to do with that, with He grabbing 12 rebounds and blocking two shots, and Makovskis contributing eight boards while making things tough for Dirigo center St. Germain throughout the night. Randy Harris, who has been coaching at Lee for more than two decades, was happy to win his first gold ball alongside his son. 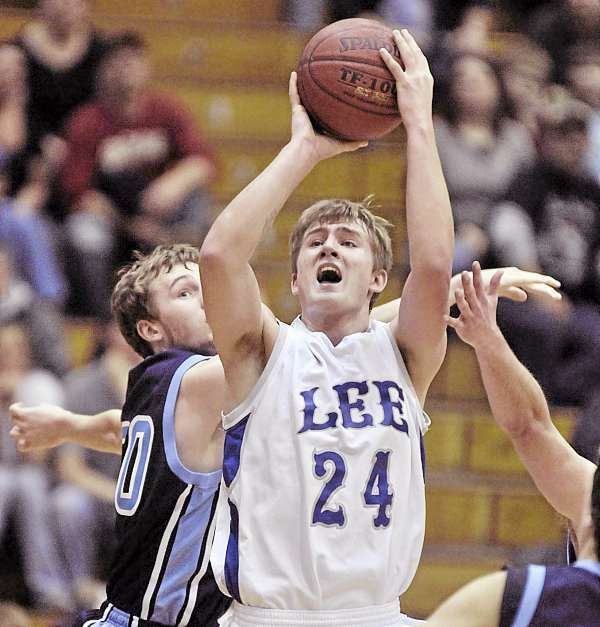 The game was back and fourth throughout the first eight minutes as the teams went into the second quarter tied at 14, but that’s when Lee’s interior defense started to stiffen. The Pandas held the Cougars to three second-quarter field goals — two coming from 3-point range — while Harris scored nine of his 18 first-half points in the period. Lee closed the half on a 14-5 run to establish a 32-22 halftime advantage. The Pandas then asserted their inside advantage coming out of halftime as He scored five straight points to give Lee a 15-point lead. Dirigo cut it to 10 on a tap-in by Ben Holmes and a 3-pointer by Turbide, but the Pandas would again counter, holding the Cougars to two field goals the rest of the quarter to increase their lead to 47-34 heading into the fourth.